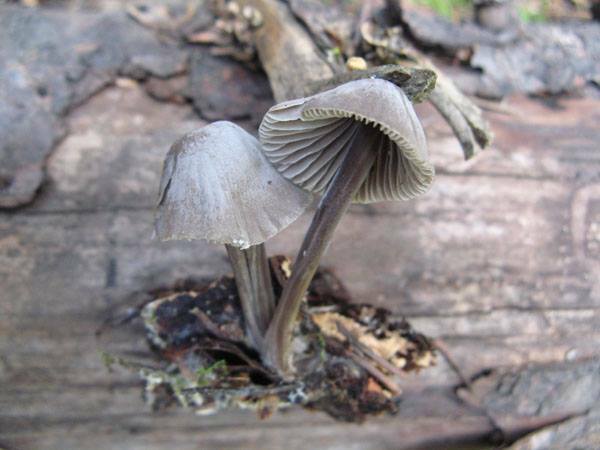 Gary Lincoff: We probably have 300 taxon in all – over the decades…maybe a lot more, given how species concepts have changed over the years…..
MUSHROOMS OF TELLURIDE – There are innumerable small mushrooms, like this OMPHALINA, in the mountains about Telluride. 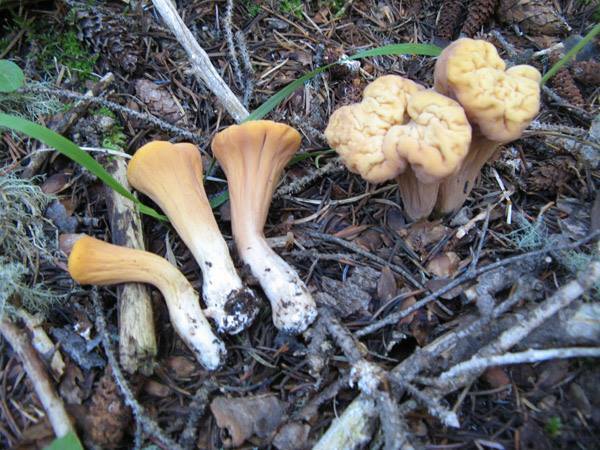 Few get collected and identified, especially when porcini and chanterelles are in abundance. We need a special team of folks who collect only small unfamiliar mushrooms…..
MUSHROOMS OF TELLURIDE – SPINELLUS sp. 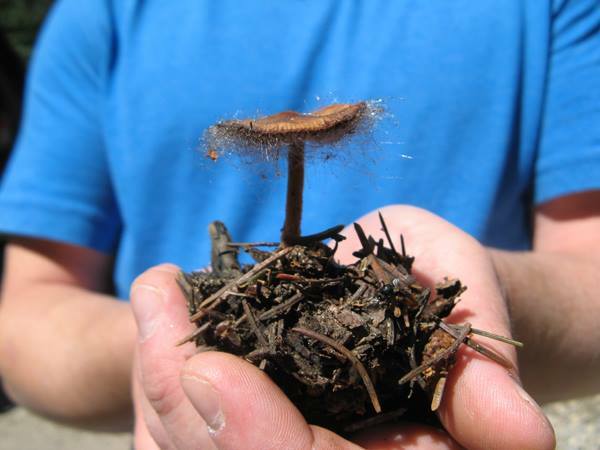 – Some of the mushrooms in the Telluride area are very small – like the “fringe” hanging off the cap of this little mushroom. 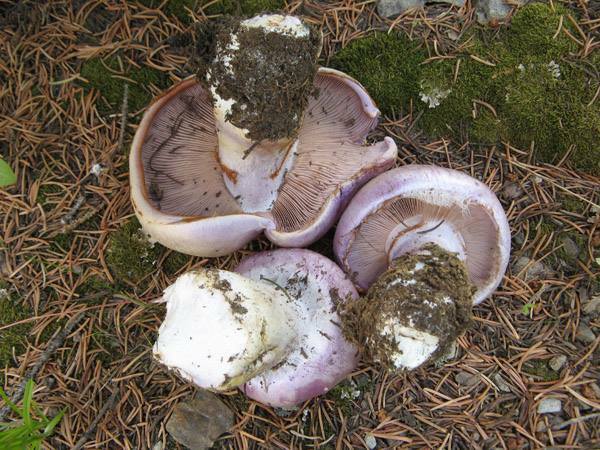 MUSHROOMS OF TELLURIDE – HYPSIZYGUS TESSELATUS – One of the really good edible mushrooms in the Telluride area, but one that doesn’t make the hit parade of the showier ones, like chanterelles and porcini. 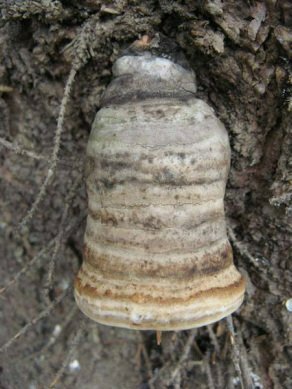 This one grows on trees, like aspen, and is a fleshy white-spored mushroom with a stout, fleshy stem that is off-center (eccentric) in its attachment to the cap. Back in the day, it was a species of Pleurotus. 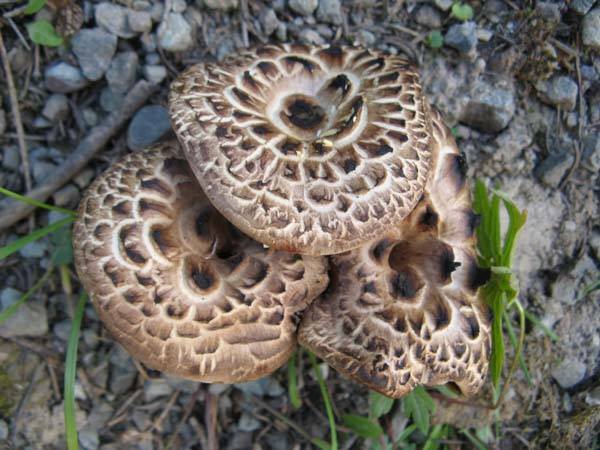 Now, it’s a Hypsizygus, a genus of mushrooms cultivated in Asia – as both a good edible and a good medicinal mushroom. 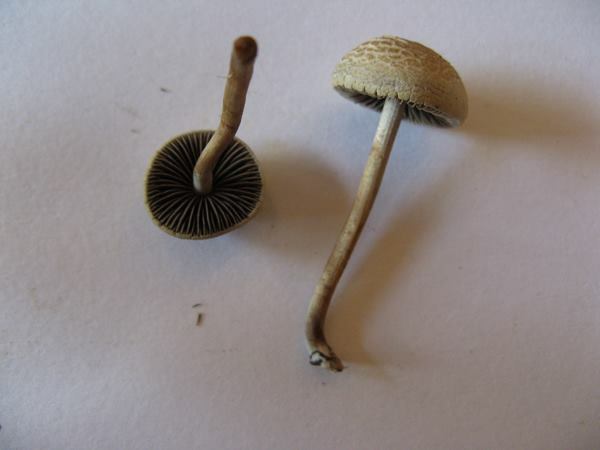 MUSHROOMS OF TELLURIDE – HYPSIZYGUS, again….Not hard to find, and once you know its on aspens, and usually grows in clusters near the base of the tree, and has white gills (and white spore print) and a distinctly off-center, stout stem, you’ve got a good concept of the genus. 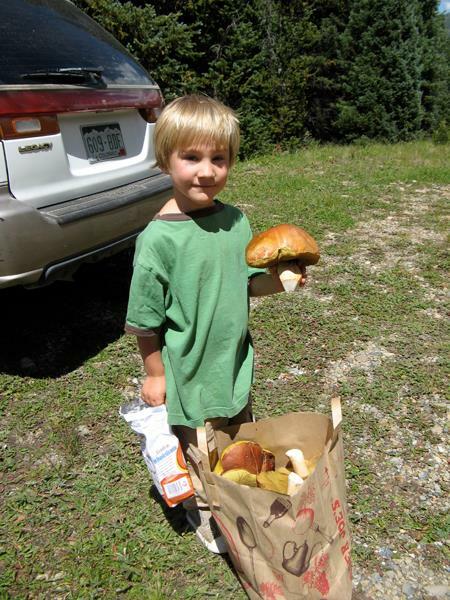 MUSHROOMS OF TELLURIDE – CORTINARIUS (usually just called “Corts”) is the largest genus of large, fleshy mushrooms in the Telluride area. Over the years we have found dozens of different kinds, or so it seems. Nobody attending the Telluride Mushroom Festival has the skills necessary to identify the Corts to species, with a few notable exceptions. Back in the day, Dr. Alexander H. Smith, at the Aspen Mushroom Conference, would routinely identify between 30 and 50 Corts over a weekend event. He knew them like nobody’s business. MUSHROOMS OF TELLURIDE – AMANITA “STANNEA” – This is the name Alex Smith used for this rather common Amanita in the southern Rocky Mountains. MUSHROOMS OF TELLURIDE – not the Agarikon (Fomitopsis officinalis), alas, but possibly Fomitopsis pinicola…….Whatever, this is a mythic shape to find in the Telluride area…..What if it’s an undescribed polypore, something that fell between the cracks, as it were, in the hey-day of polypore collecting and describing…..? It doesn’t have to be this or that. It could be something local, locally restricted. A photo of a single fruiting body, without habitat, substrate, reagent or microscopic data….or DNA sequencing! – is just a rumor, a guess, and not worthy of attention – until the specimen can be produced and examined. 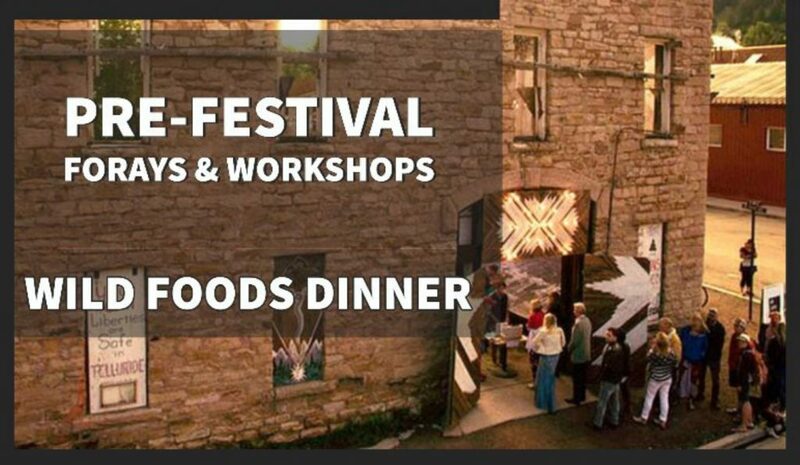 See if you can wrest it from me at Telluride this year! 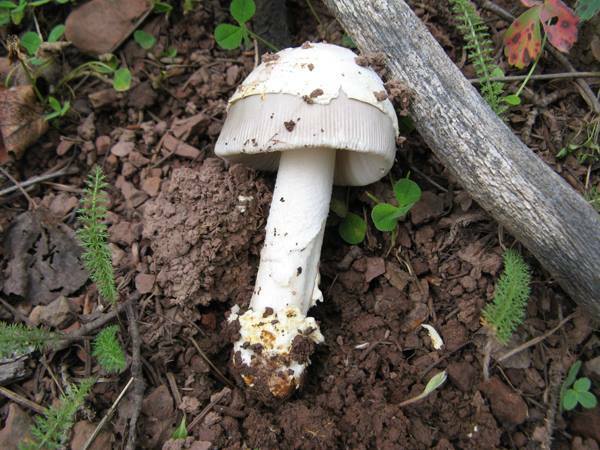 MUSHROOMS OF TELLURIDE – AGARICUS AMICOSUS – a very common Agaricus in the mountains forests surrounding Telluride…..Is it edible? Well, we ate it a couple of times and found it good, with no problems arising afterwards. Enough to label it edible? Not enough info yet. 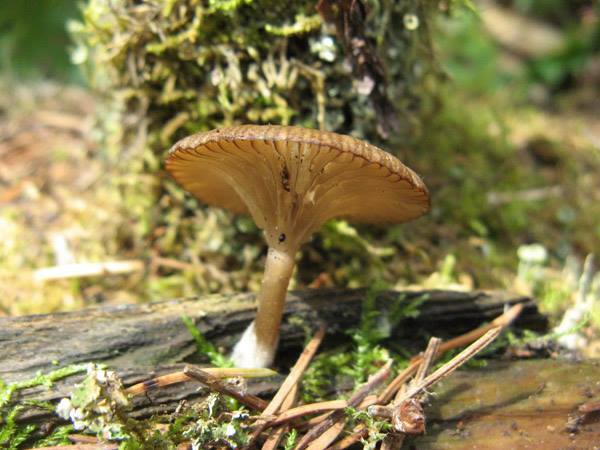 MUSHROOMS OF TELLURIDE – Just one of more than a dozen species of MYCENA in the Telluride area…..
MUSHROOMS OF TELLURIDE – TRICHOLOMOPSIS RUTILANS – on conifer wood, but usually at somewhat lower elevation than Telluride…. 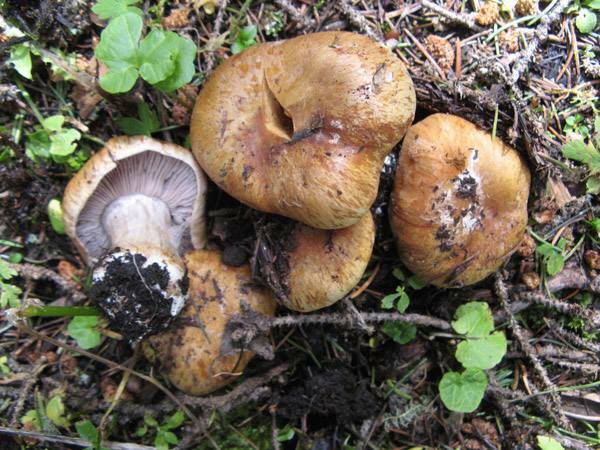 MUSHROOMS OF TELLURIDE – One of the prettiest mushrooms in the Telluride mountains is this Floccularia americana (called Armillaria staminea var. americana in the Audubon Guide). 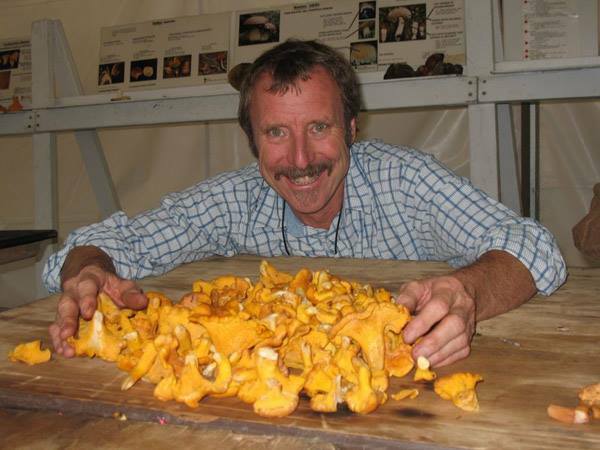 It’s a little known edible, and never abundant, but brought in every year during our Telluride Mushroom Festival. MUSHROOMS OF TELLURIDE – BOLETUS BARROWSII – Perhaps even a better edible than the King Bolete, the Telluride Boletus “edulis.”….. Boletus barrowsi is one of those mushrooms found en route to Telluride – not actually in the Telluride area – but folks drive in with the mushrooms they find along the way – and this is one of the best of what’s brought in….These Out-of-Area mushrooms are placed, labelled accordingly, on the display tables, and we are the richer for it. The Rocky Mountains in August can be the equal of any mushroom hunting place on Earth. Some years it’s better than anywhere else in our known galaxy. 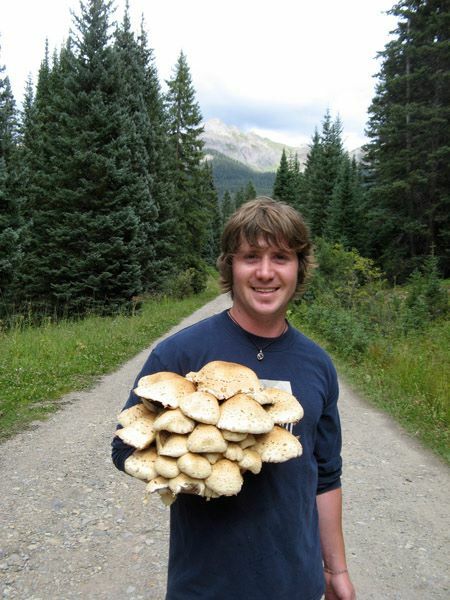 MUSHROOMS OF TELLURIDE – “Trust but Verify” is the watchword at every mushroom display everywhere. Here, a beautiful Amanita collection is not what its label says. 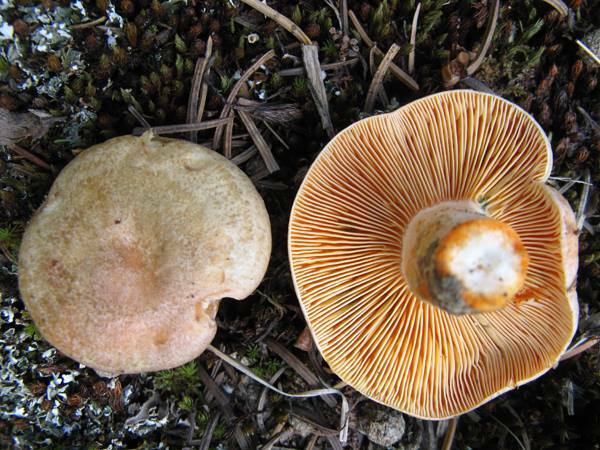 It seems to be AMANITA BARROWSII, if that described taxon has been published officially yet. There are a fairly large number of Amanitas in the group that includes Amanita vaginata and Amanita fulva. The more we examine these populations, the more differences we find, and many of them seem to deserve species status recognition. 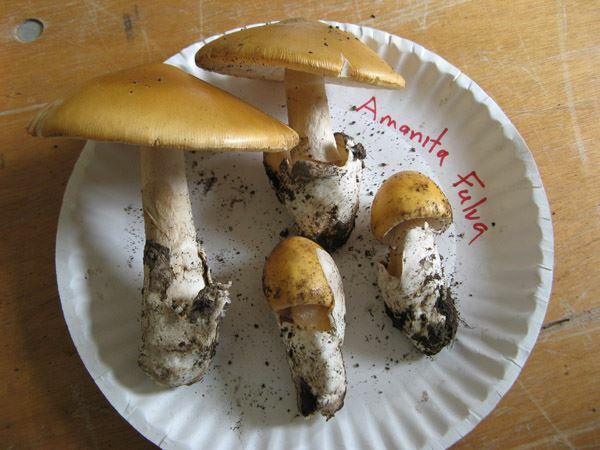 Amanita barrowsi, named in honor of the great southwestern amateur mycologist, is one of these. 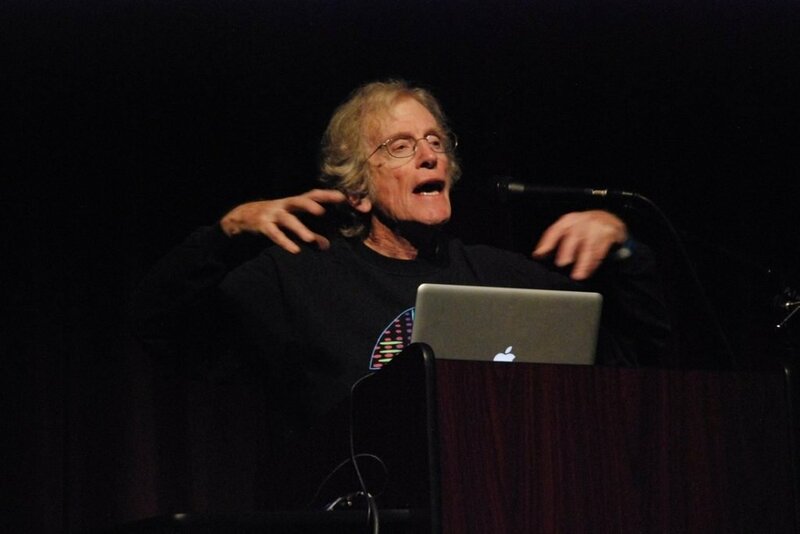 I know Sam Shushin identified the lichens in the area – and there are huge, reliable checklists for those species in different parts of Colorado. 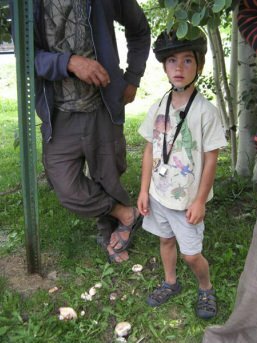 MUSHROOMS OF TELLLURIDE…..The Checklist…..in parts…..
MUSHROOMS OF TELLURIDE…..The Checklist…..in parts….. The ASCOMYCETES (as recognized in the Audubon Guide)…..
Gyromitra esculenta, G. infula, Helvella acetabulum, H. crispa, H. elastica, H. lacunosa complex, Morchella elata complex, Peziza badio-confusa, P. repanda complex, many unnamed species of Peziza, Sarcosphaera “crassa,” Geopora cooperi, Geopyxis cupularis, Otidea auricula, O. leporina, O. smithii, Scutellinia scutellata, Chlorociboria aeruginascens, Mitrula paludosa complex, Neolecta irregularis, Spathularia flavida, Dasyscyphus sp., Bisporella citrina, Cudonia circinans, C. monticola, Hypomyces chrysospermus, H. lactifluorum, H. luteovirens, H. sp. on a Helvella. 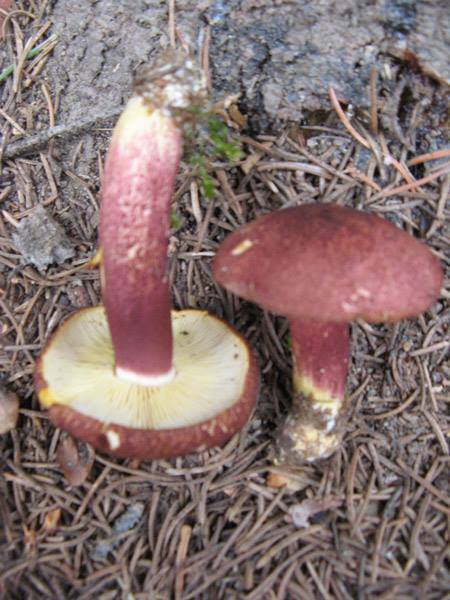 In addition, several true truffles have been found in Telluride, as well as other hypogeous ascomycetes. These have not been named or preserved, but their locations are known. Obviously, only the most conspicuous Ascomycetes have been collected over the years. 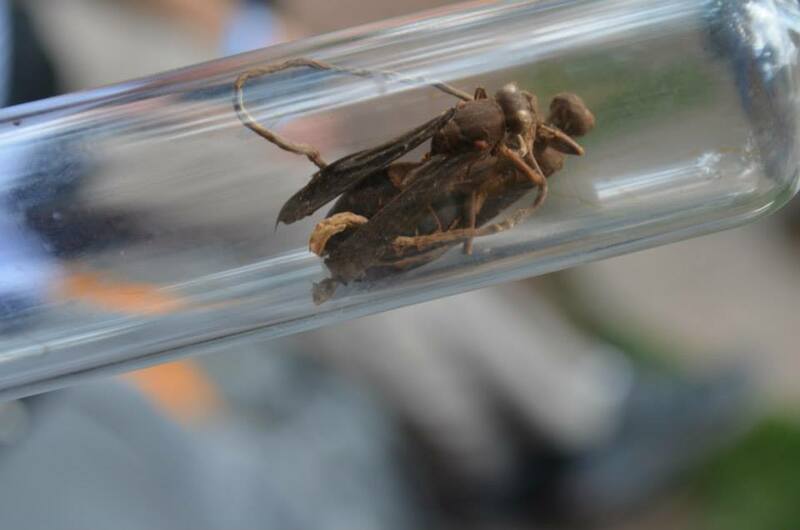 Large numbers of Sordariomycetes are out there, just waiting to be collected and recognized. Maybe this year! 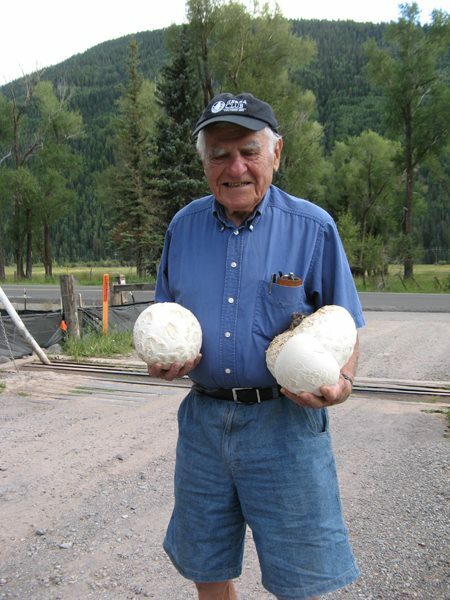 Six months to go…..we’re half-way there…..Lots to plan for and lots to review from past years – Now the count down begins……Let’s post a Telluride Mushroom Festival Mushroom-a-Day…..Here’s Manny Salzman with our classic western Giant Puffball, Calvatia booniana…..and our best way of preparing this mushroom, transforming it from a forgettable meal to something truly delicious. 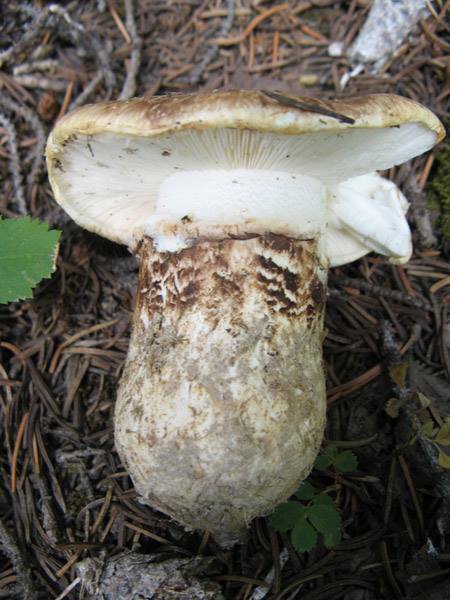 Telluride Mushroom of the Day – the King – King Bolete – the Telluride Porcini – Boletus “edulis” – the best edible mushroom in the Rocky Mountains. 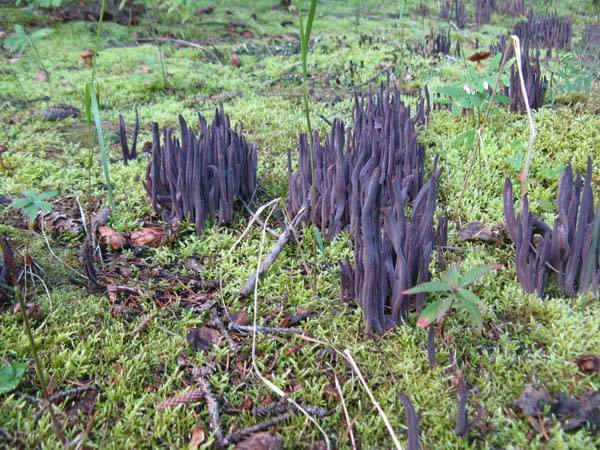 MUSHROOMS OF TELLURIDE – ALLOCLAVARIA PURPUREA – One of the most beautiful of the coral fungi. 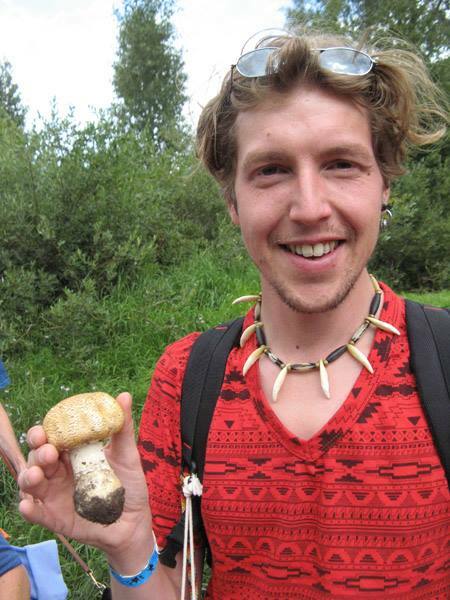 We found this patch spreading over a 20 foot area – like a village, with clusters of purple dwellings throughout – a world unto itself…..
MUSHROOMS OF TELLURIDE – A prince finds The Prince (AGARICUS AUGUSTUS)……..right in “downtown” Telluride ! This is one of the best of the edible species of Agaricus. It has the odor of almond extract (or anise, depending on your nose), and this translates into a delightfully flavored cooked dish. 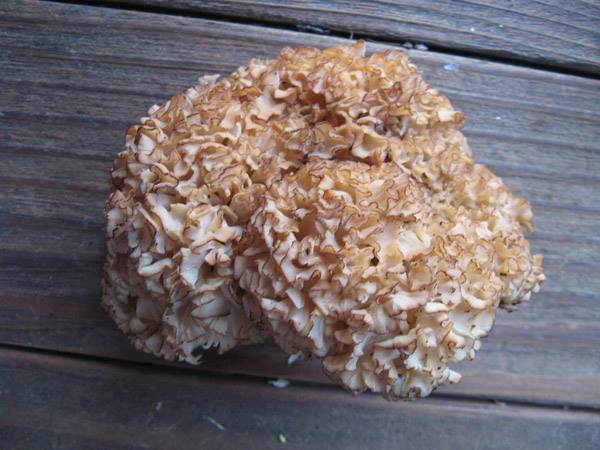 MUSHROOMS OF TELLURIDE – SPARASSIS – Cauliflower Fungus – Not at all common in the Telluride area, but a choice edible, and large enough to serve as an entree to a dinner table full of friends. Hard to mistake what looks (to me) like an Elizabethan ruff growing at the base of a tree. 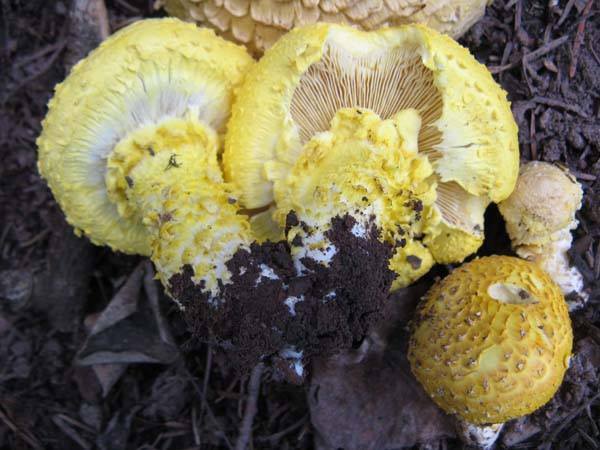 MUSHROOMS OF TELLURIDE – HYPOMYCES LUTEOVIRENS – This yellow-green mold covers the gills of some red Russulas in the Telluride area, and elsewhere. It would seem that there is only one such entity like this, until we learn differently. 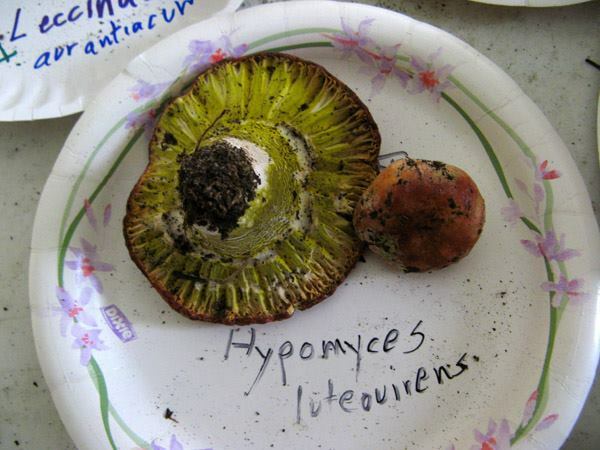 Hypomyces is a large genus of mycoparasites, including the Lobster Mushroom, Hypomyces lactifluorum, which is a choice edible, that, alas, does not occur in the Telluride area [see correction below!]. We wondered whether Hypomyces luteovirens is edible, so we had a test trial, cooking it and serving it to a number of “volunteers.” We have eaten this now several times, and it is certainly digestible and tastes good enough to want to eat. We just don’t know exactly how much, if any amount, might be too much, either at a single meal or eaten on consecutive days. This kind of information fits into the category of trial and error. Perhaps the most lethal mushroom in the Telluride area is Hypoxylon mammatum, now called Entoleuca mammatum. 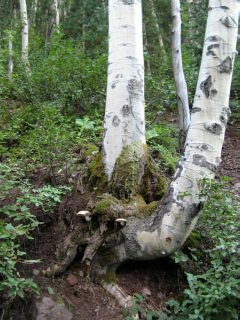 It is called the Hypoxylon Canker of Aspen, and is responsible for vast numbers of Trembling Aspen deaths. It also occurs on other poplars, as well as willows. It never comes in to the display area, but collectors pass by it all the time. 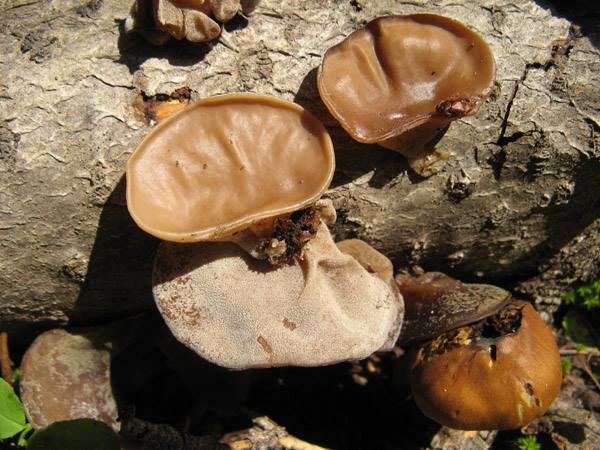 MUSHROOMS OF TELLURIDE – A “gilled” Polypore – GLOEOPHYLLUM SEPIARIUM……One of the common polypores found in the mountains surrounding Telluride…..
Perhaps the most valuable mushroom in the Telluride area is a LICHEN! Species of Peltigera lichens form much of the ground cover in the surrounding spruce forests. These nitrogen-fixers help maintain the fertility of the soil here. 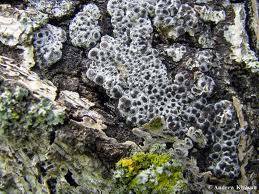 Lichens, alas, are rarely collected or brought in for ID. MUSHROOMS OF TELLURIDE…..The Checklist…..in parts…. The rarest mushroom found in Telluride over the past 3 decades has been the MOREL….the Black Morel…..several of them found by Cathy Cripps near Bridal Veil Falls…in late August!…..Photos are stored as slides. No specimens available. 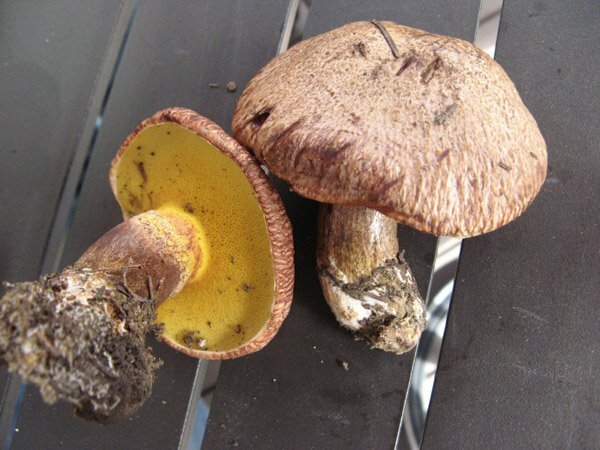 MUSHROOMS OF TELLURIDE – SUILLUS LAKEI – There are only a few different boletus in the Telluride area. 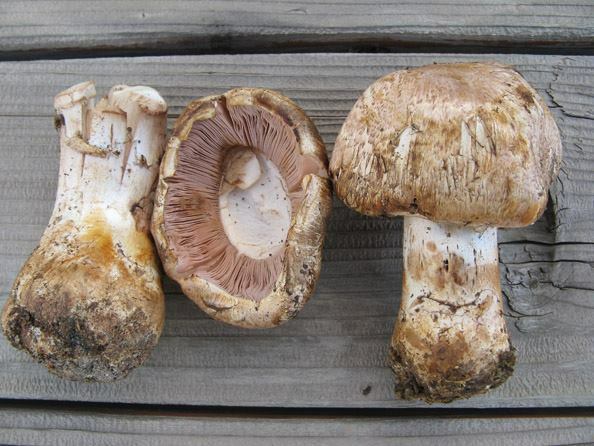 Fortunately, the one we all want, the Boletus edulis type, is very common. Here’s another bolete, SUILLUS LAKEI, that we find every year. 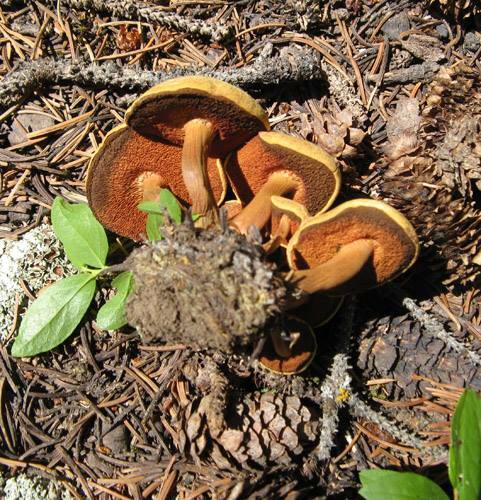 MUSHROOMS OF TELLURIDE – CHALCIPORUS PIPERATUS – This little bolete occurs around the spruce trees in the Telluride area. It has orange pores and a bright yellow stem base (not visible in this photo). It’s got a biting, peppery taste. Said to be edible if well cooked, but there are always so many good edibles about that many of the Telluride area mushrooms never get sampled. 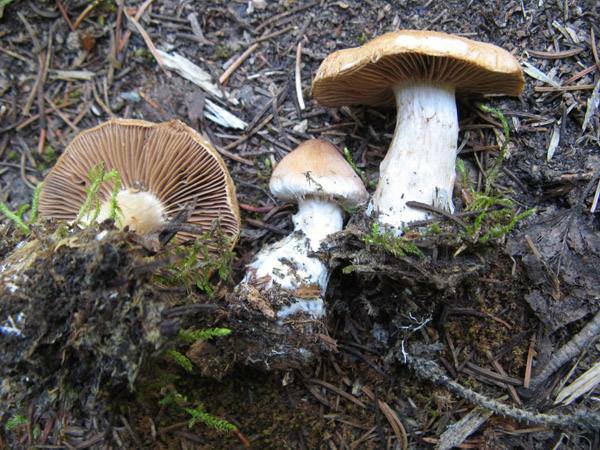 MUSHROOMS OF TELLURIDE – A Two-fer day here…..Both these mushrooms were once placed in the genus Cantharellus, and then, after a few re-thinks, into the genus Hygrophoropsis. At the moment, the mushroom on the left is Hygrophoropsis aurantiaca (aka the False Chanterelle). 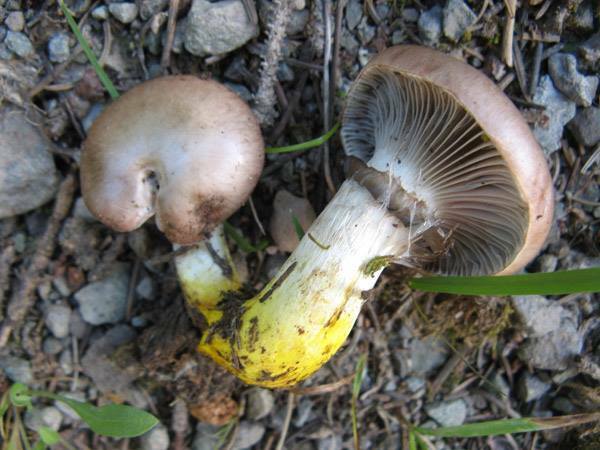 The mushroom on the right is now known as Aphroditeola olida. It has a pinkish tint to it (not really seen in this photo) and it has a very sweet odor, like juicy fruit gum or butterscotch. Both occur in the Telluride area. It’s hard to stop smelling the Aphroditeola olida; it’s that entrancing. Neither is a good edible, but neither is known to be poisonous, either. Just pleasing to find. 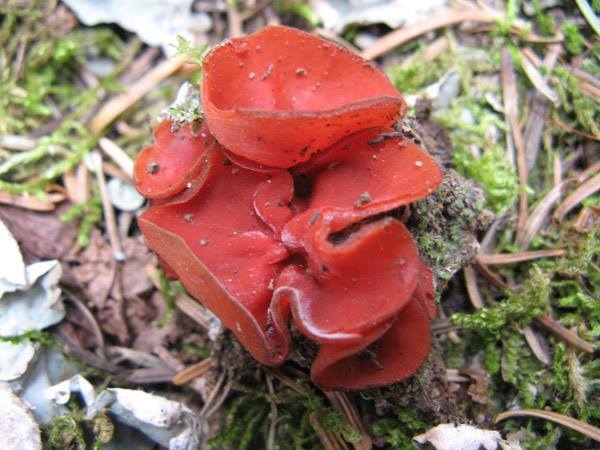 MUSHROOMS OF TELLURIDE – Here’s a real beauty in the Telluride area – a Scarlet Cup (SARCOSCYPHA) – just one of more than 200 different mushrooms that we place on our mushroom display tables at our annual Telluride Mushroom Festival…..
MUSHROOMS OF TELLURIDE – Some of the POLYPORES……..
Telluride Mushroom Festival – Giant Porcini – and the kids shown here (2011) are almost twice as big now…..
MUSHROOMS OF TELLURIDE – Some mushrooms are easier to identify than others……This GOMPHIDIUS has such a bright yellow lower stem that you know it on sight…..not a great edible, but very pleasing to see…. MUSHROOMS OF TELLURIDE – The most over-photographed mushroom in the Telluride area, if not the entire world, is the “thing” we call the Fly-Agaric, AMANITA MUSCARIA, or however it’s being understood here, there, and everywhere. 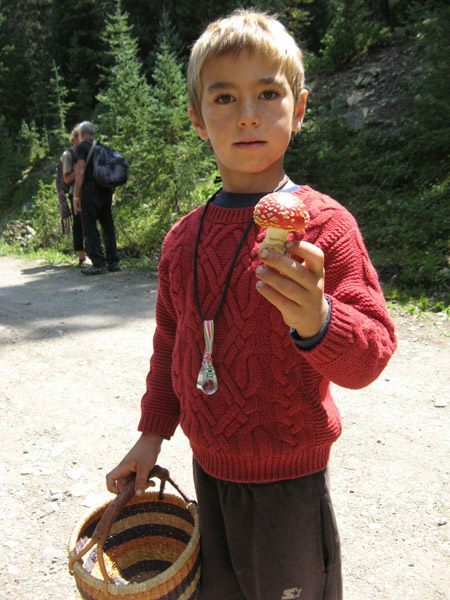 Here is Telluride’s Fly-Agaric, proudly held by Moss, one of our Telluride Mushroom Festival’s best collectors. 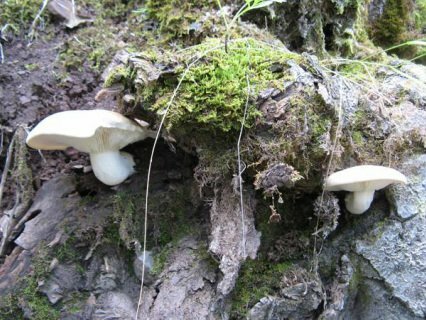 MUSHROOMS OF TELLURIDE – This is the strangest edible mushroom I’ve ever encountered – Hawk Wings, aka Scaly Tooth – Sarcodon imbricatus – a VERY common tooth fungus (the underside of the caps is a layer of toothlike spines instead of pores or gills) in the Telluride area. 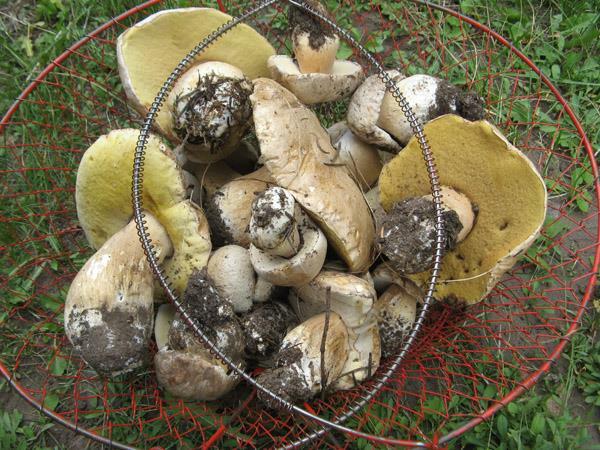 Everyone seems to have some in their baskets as they return from daily mushroom hunts. 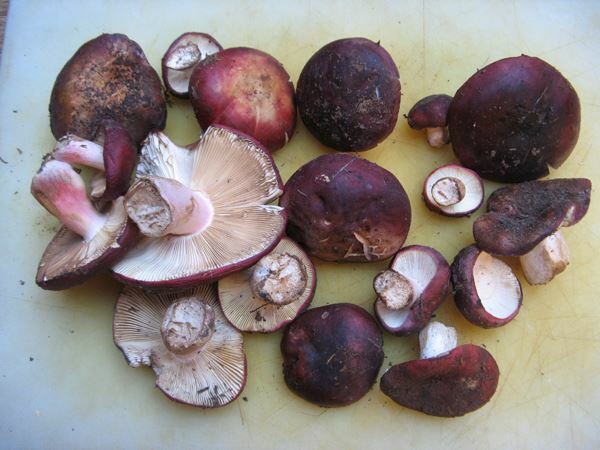 Some of us LOVE this mushroom and cook it in a number of different ways – sautéed, in soup, in pasta, etc. 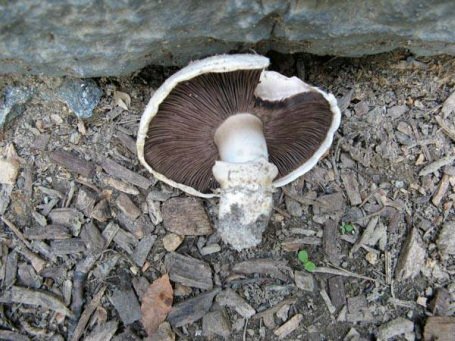 Others of us HATE this mushroom and avoid it like the plague, readily detecting it even when it is artfully concealed in a cooked dish. How bizarre! But we are all agreed that it is a beautiful mushroom to see in the woods. 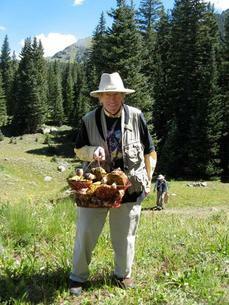 MUSHROOMS OF TELLURIDE – CHANTERELLES – A Linnea Gillman photo of John SirJesse with Telluride Gold. 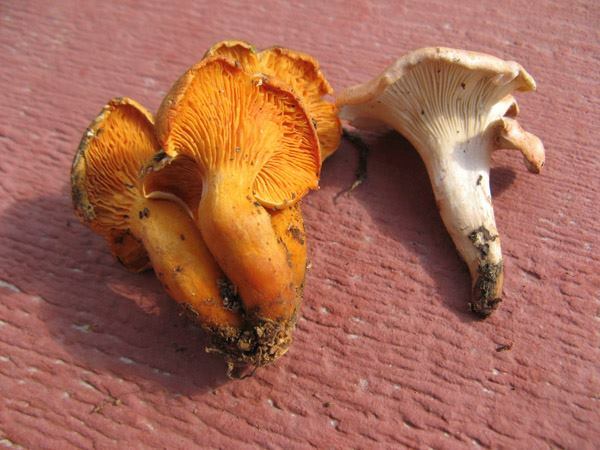 This chanterelle is one of the best edible mushrooms of Telluride. It’s also one of the most fun to find – and some years it takes a lot of hunting to find this many. Some years the hills are paved with gold. 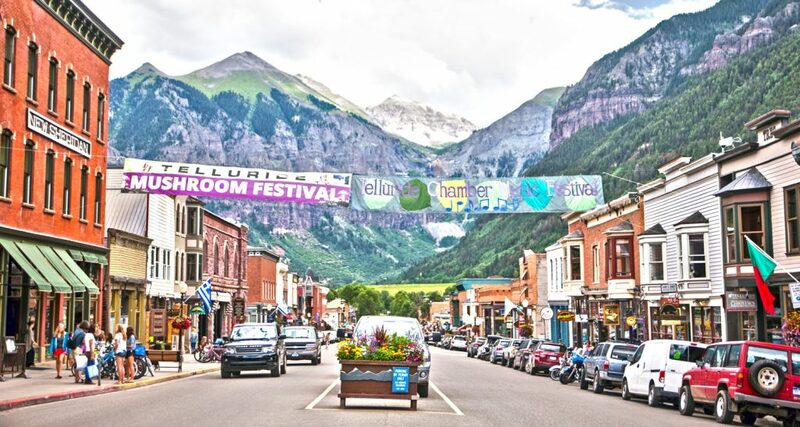 Come to the Telluride Mushroom Festival this August and see what you can find. 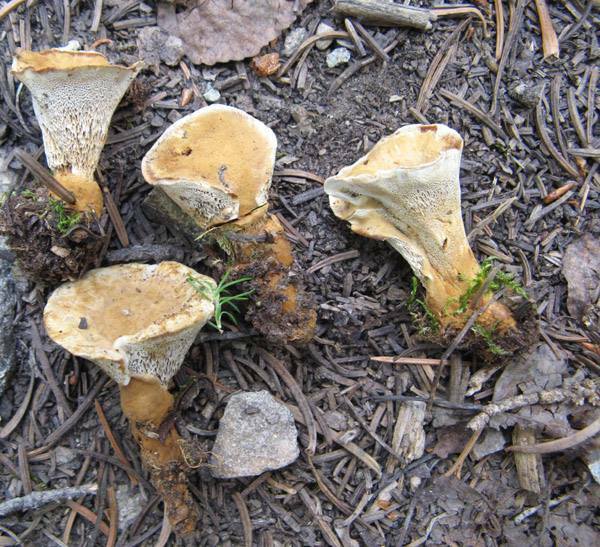 MUSHROOMS OF TELLURIDE – PHOLIOTA SQUARROSA is one of the large, clustered mushrooms we find about stumps. 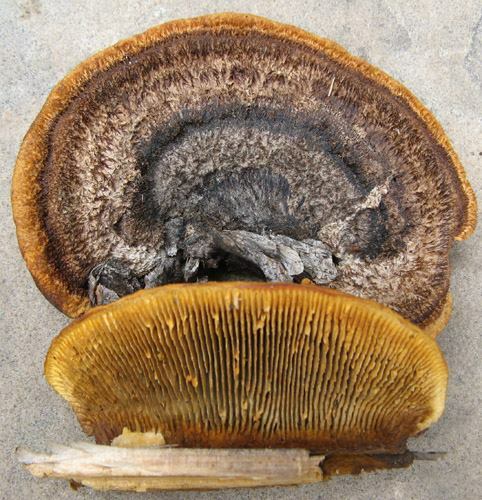 It can resemble Honey Mushrooms but it has a very scaly cap, gills that smell distinctly garlicy, and a brown spore print. It’s fun to find even if it’s not one of our collectible edibles. 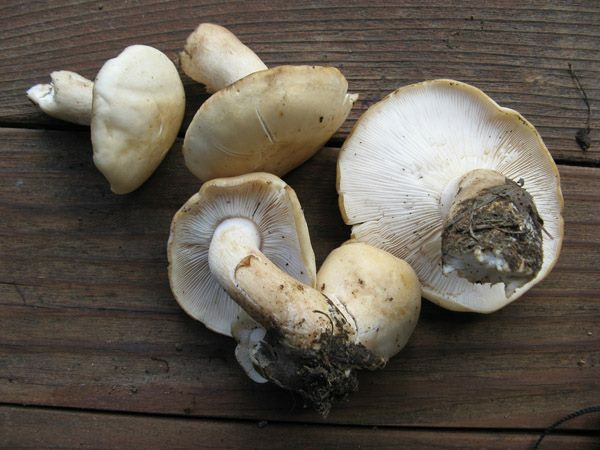 MUSHROOMS OF TELLURIDE – TRICHOLOMA CALIGATUM – Matsutake Mushroom of Telluride…..One of the very best edible mushrooms in the Telluride area. Also, the most fragrant of the mushrooms we find here. We look for it every year, and some years find lots. Great sliced thin and grilled. Also makes a very flavorful soup or rice dish. MUSHROOMS OF TELLURIDE – A patch of mushrooms just outside the Visitors Center – Moss standing over AGARICUS BITORQUIS, a common urban species of Agaricus – We have never seen this species in the surrounding mountains. 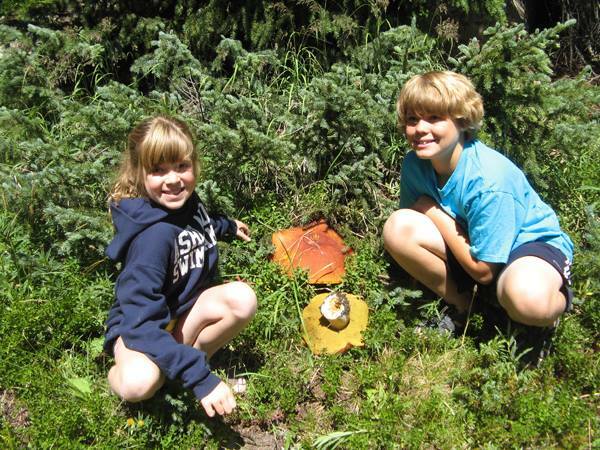 MUSHROOMS OF TELLURIDE – This is a mushroom that we find under our Engelmann spruce trees in the Telluride area. It’s the mushroom we have traditionally called LACTARIUS DELICIOSUS. It is NOT that species, but it IS delicious. Much of what we find in the U.S. that looks like Lactarius deliciosus is not the “real” L. deliciosus, either, but most of what I have tried elsewhere, I found mediocre at best. This can be quite common in the Telluride area. It is firm and meaty. It takes slow cooking to bring out its best flavor. 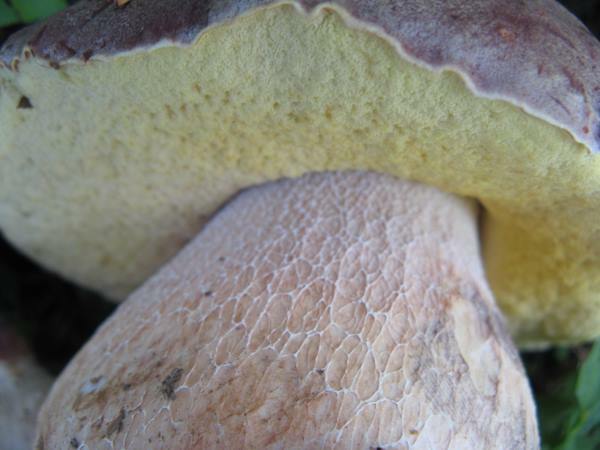 (Species of Lactarius are known for their milky nature – if you cut the gills, a milky latex-like substance exudes that, depending on the species, can be clear, white, yellow, orange to red, even blue. 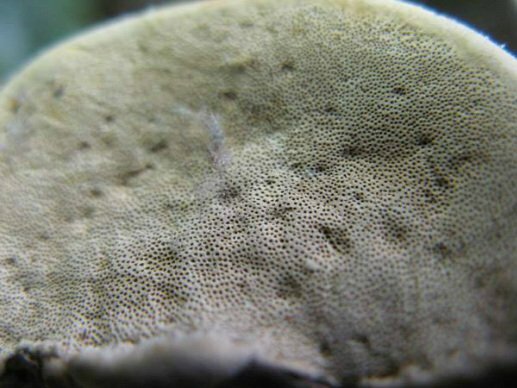 Sometimes, a white latex will stain the gills brown, or change color, so a white liquid will become yellow or purple in a minute or so. )….This species produces a bright orange latex – best seen on cutting the stem in half, cross-wise, and looking at the bright orange color that develops about the inner edge of the stem. MUSHROOMS OF TELLURIDE: Sweet Coral Clubs – CLAVARIADELPHUS TRUNCATUS – an easily recognized mushroom in the Telluride area – We think of it as a dessert mushroom – it’s so sweet that it can be poached or steamed and served with a squeeze of orange juice and a dash of confectioner’s sugar…..
Panaeolus cinctulus – this photo is from the NEMF foray in the Adirondacks a few years back – but this mushroom was found in Telluride on the Saturday morning San Miguel River walk – It’s a first for the Telluride Mushroom Festival…..the first actual psychoactive mushroom found growing in the Telluride area – the one said to be found on elk dung on Lizard Head many years back is suspect – maybe not local, after all, and it has never been recollected. We will go straight to this site next year and watch for more…..
MUSHROOMS OF TELLURIDE – This little THELEPHORA is often underfoot on the trails in the mountains of Telluride. It would seem we set our eyes on a certain size for mushrooms and anything smaller, unless it’s brightly colored, just goes unobserved…. 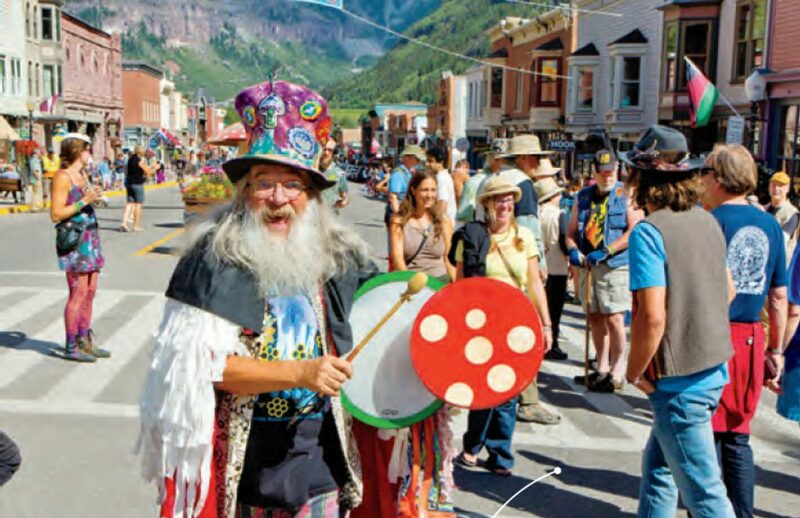 The Telluride Mushroom Book – a collector’s item – only 100 or so copies left – and they will be available at this year’s Telluride Mushroom Festival. After they’re gone, we’ll be publishing a new edition – new everything to keep up with all the cool mushroom stuff that’s been happening the past decade or so….. Here is the species list from Noah, based on the Herbarium records from San Miguel County, CO. Most collections are Smith’s. DLC: Clearly there’s work to be done if we want a comprehensive list! 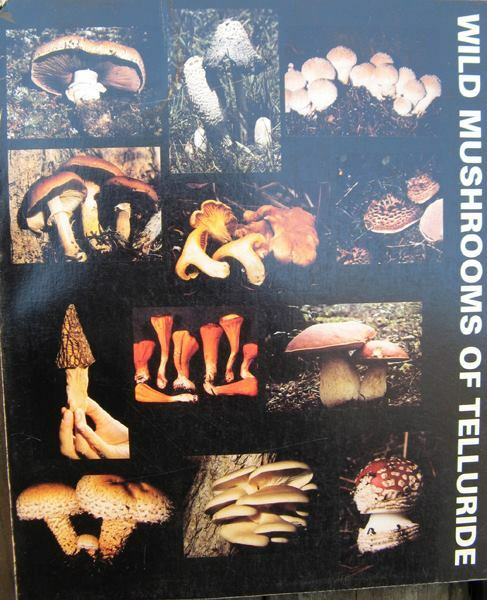 The book cited by Noah Siegel above (Wild Mushrooms of Telluride) has a VERY comprehensive list starting on page 115 that was compiled by Lincoff, Bill and Karen Adams, David Bill, and Cathy Cripps (probably around 1990). This is broken down by Class, Order, and Family. What would be cool is to update this significant work from the past six decades with images and links. In list below, Dan has added “missing” entries and linked them to well-known online taxonomies (this done after 2014 TMF).